National exit polls report that Asian voters supported Clinton by 65% to 29%, which is a lopsidedly left margin that indicates that Clinton managed to retain the Asian American, as well as Black and Latino electorate. I’ve already discussed concerns about electoral capture raised by such voting trends. 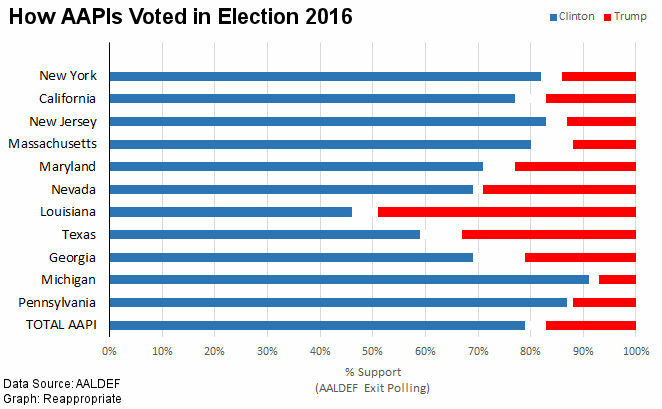 However, there’s another problem: this exit polling appears to woefully underestimate AAPI support for Clinton on Tuesday; probably because this national exit poll surveyed less than 1000 AAPI across the country, and conducted their poll only in English. Two separate polls that corrected these problems and conducted on or near Election Day reveal that AAPIs supported Clinton by an even more lopsided margin than that reported in mainstream media. In a phone-based survey within the week leading up to November 8th, 2016 by UC Berkeley researcher Taeku Lee, 75% of AAPI respondents reported that they would be voting for Clinton. 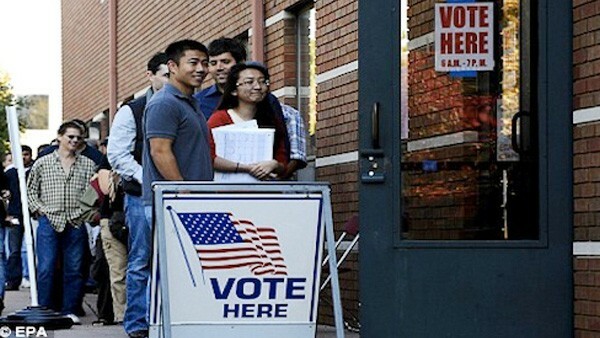 Corroborating that finding, exit polling conducted by the Asian American Legal Defense and Education Fund (AALDEF) of over 14,400 AAPI voters who cast ballots in 14 states also reported that 79% of AAPI voters supported Clinton. Both polls are more precise than national exit polling data because they over-sample AAPI voters, and surveys were conducted in multiple non-English languages. These numbers indicate that AAPI voters actually voted for Hillary Clinton at roughly the same margins as they backed Barack Obama in 2012; in that election, 77% of AAPI voters supported Obama. This support was consistent across most states, including traditionally red states. Furthermore, early reports from APIAVote suggest that AAPI voter turnout may have reached an historic high in the 2016 election: data from states such as Nevada, Florida and North Carolina indicate that AAPI turnout among early voters was nearly double its rate in previous years. Notably, Clinton’s support was highest among AAPIs living in Michigan and Pennsylvania, two states that ultimately decided the election’s outcome by flipping for Trump. Commentators who suggest that Clinton failed to retain AAPI voters are just plain wrong. Clinton performed exceedingly well among AAPI voters, who chose on Tuesday to join Black and Latino voters to preserve the Obama coalition. Instead, it was the White median voter in rural middle America who abandoned left-wing America and who elected into the White House a blustering bigot whose plan for his first 100 days in office will materially devastate public policy that benefits America’s most most vulnerable populations. We — Black, Latino, and Asian & Pacific Islander America — didn’t do this. These next four years is entirely on the 58% of White voters who voted for Trump. Please stay tuned for more Election 2016 coverage in the coming days. If you would like to submit your own writing for publication on Reappropriate, please do so here.